In today’s embedded world, it is very common to be creating bootable micro SDs. And then very often replicating them using raw dump of the micro SD (uSD) into an image file, say using dd command. And then creating another bootable uSD by flashing the image file into the uSD, again using dd command. NB 1GiB has been achieved using 32 Kibi blocks of 32 KiB each, because nowadays 32KiB is quite an optimal block size in Linux. NB 2097151 is the last sector number in our image, but the third partition may not be able to extend till there, and the last command above may prompt for an alternative last sector. Accept it with “y”. NB One may use any other partitioning utility like fdisk, as well. $ sudo blockdev --report /dev/loop? NB If the partition sizes are not multiple of 4096, their block size (BSZ) would reduce to 512. All done – file.img is the desired uSD image. In fact, one may use the above learnings, to access the contents of an already existing uSD image, without raw dumping or flashing it in a uSD. Go ahead & try it out. And finally, why only an image of a uSD, you may create &/or decode any damn storage image, using just what has been learnt. 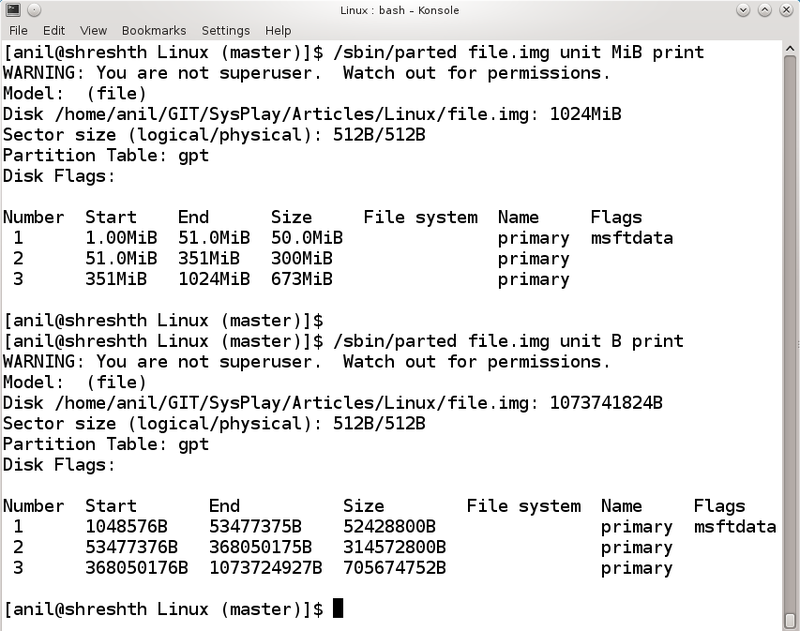 This entry was posted in Linux and tagged blockdev, dd, losetup, micro SD image, mkfs.ext4, mkfs.vfat, mount, parted, storage image, touch, umount, uSD image on February 1, 2019 by Anil Kumar Pugalia.